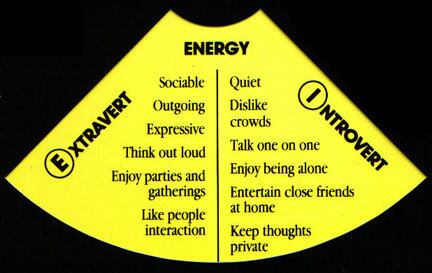 ENERGY - Extraversion and Introversion are the clues to how people prefer to generate and focus their energy. INFORMATION - Sensing and Intuition are the clues to how people prefer to gather information. DECISION - Thinking and Feeling are the clues to how people prefer to make decisions. ACTION - Judging and Perceiving are the clues to how people prefer to take action. The purpose of Side 1 of the Wheel is to pick the four letters that represent your own or someone else's personality type, based on the four key behavior patterns. To begin The PEOPLE Process®, turn to the Yellow ENERGY window. Read the descriptions for the Extravert on the left side of the yellow window and read the descriptions for the Introvert on the right side of the yellow window. Decide which group of descriptions sounds more like you or someone else. Sometimes people see parts of themselves in both sides; however, there will be one side that applies more to the person. The purpose of Side 2 of the Wheel is to understand how to relate to others based upon their personality type. By doing this we can begin to understand another person's process and behavior, eliminating the expectation that they should behave like us. Once you have decided which letter, E or I, best describes how ENERGY is gathered, click on either Extravert or Introvert and go to Side 2 of the Wheel and learn five key ways of relating to and treating that person. If you have chosen for yourself, read the key ways someone would relate to you and verify you have chosen the correct letter. The PEOPLE Process® is a major breakthrough for worldwide communication.